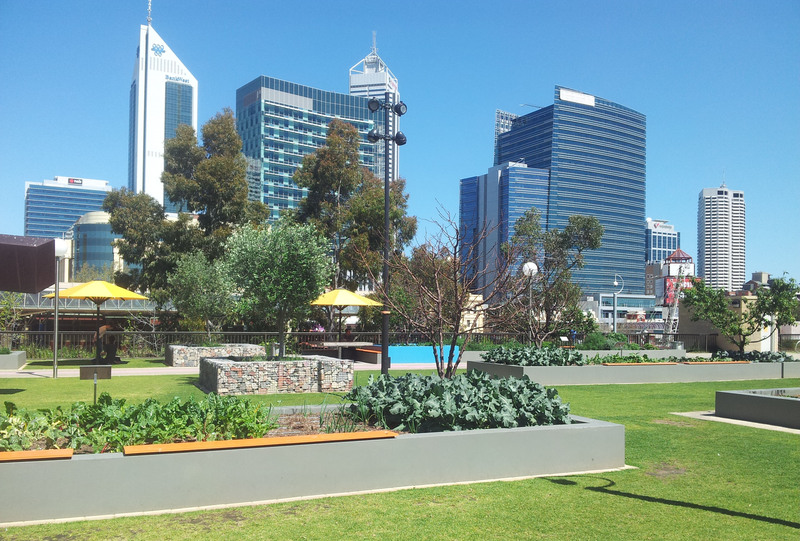 The amazing Urban Orchard outside Perth’s art gallery. Nice crop of broccoli! We departed on a frosty Auckland morning and arrived in Perth as the red sun slunk behind the city’s Phoenix palms. The next morning, the mercury hit 25°C by 10am; it peaked at 29°C! Not bad for September. We spent our first day trekking through native bush, spotting fair dinkum Aussie species with common names like pepper and salt, bacon and eggs and kangaroo paws. Our eagerness to step off the beaten track to admire donkey orchids and mouse ears, however, retreated rapidly upon the sighting of our first tiger snake. In Margaret River, we hooked up with Sean Blocksidge from the Margaret River Discovery Co., who runs “the tour for people who don’t do tours”. People like Judy Bailey. When she turned up with her film crew for a quick paddle, Sean was mortified to discover that his canoes had been set adrift by boozed-up Aussie yobbos. He had to strip down to his daks and dive in to retrieve them. Though we didn’t get to see Sean in his smalls, he did show us a satisfying selection of humpback whales, emus and scary looking, stumpy-tailed shingleback lizards. Sean told a cracker yarn too, like the time a group of Japanese tourists started fizzing at the bung at their first kangaroo sighting. “Kangaroo! Kangaroo!” they exclaimed as their cameras clicked. Sean didn’t have the heart to tell them it was just a brown dog doing its business in the bush. Speaking of business, we flew up front, on lie-flat beds with marshmallow-soft memory foam mattresses, ruining me for cattle class forever. The nosh – would madam like an entrée of five-spiced chicken breast salad with fresh papaya salsa and sesame ginger dressing, followed by miso braised beef short rib with mustard potato mash and green olive tarragon salsa? – was top-notch too, but the beverage service left, literally, a lot to be desired. If I was asked once, I was asked a dozen times if I’d like a free glass of champagne. And (almost) every time, I thought of Lucas’ little brother, half-formed inside me, sighed, and declined. It was, let me tell you, a special kind of torture! Sounds like you had a wonderful time Lynda. For one who works so hard, you deserved that holiday. Am sure what you saw in all the beautiful wildflowers and Aus, animals and scenery, would have compensated for not having a glass of ” bubbly”. Loved the story of the dog being mistaken for a kangaroo!! Hilarious!. — My eldest sister and brother-in – law who live in Melbourne, have done a lot of travelling around Aus. and just loved the Wildflowers of WA. Take care, and look after yourself and the liittle one. Wishing you a trouble free pregnancy. Does Lucas know he is to have a wee playmate?? Look forward to Fridays to recieve my e newsletter, and of cause the end of the month for NZ Gardener. Back to the Land. I am loving every page, the photographs are superb, the prose informative and very interesting and the recipes are good too! I do admire our attitude to life, your work ethic and your sense of humour. Thank you for a book that I shall treasure and refer to many times. Hi Lynda. I also love wildflowers, my garden is over flowing. But it really doesnt pay to put at least 6 packets in the same area plus all the seeds I had saved from last year. I have yet to find my love in the mist. Here in good old Invercargill, well to be precise South Invercargill we have have a group called South Alive. Which is trying to rejunvinate the area. My group the fruit and nuts 🙂 have planted at least 50 fruit trees. Grangages, Black Boy Peaches, Pears, Apples. All in reserves, and parks. We have also planted four apple trees in a school here in South Invercargill. Our group is also going to be doing the urban garden, starting in the New Year. We are also hoping to plant Almonds, Walnuts and any other nuts that will grow down here. I have just got your book from the library, sadly it is only a two week hire. So I think I will be buying it, and now that I have read that you have also published to other books I will see if the library has those to. Enjoy your holiday.